All of our CanSkaters, PreJunior Skaters and STARSkaters are invited to join in the fun, team spirit and camaraderie of this year’s Ice Show. Our past and current skaters always rate this popular bi-annual event as among their best skating memories. Our skaters are truly the stars of the show, in an event that showcases the talents and achievements of each participant. This year’s theme will take our skaters on a journey to Paris. Using the vast range of music and all things with a French inspiration, we hope to create an enchanting and entertaining show targeted for all ages. Our Annual Ice Show will be on Saturday, March 30th at 1:00 p.m. and at 6:00 p.m. The dress rehearsal for both shows will be held on March 29th at Kanata Recreational Complex (more information about that to come). Skaters are encouraged to attend as many practice sessions as possible. In a perfect world all skaters would be able to attend every session however we understand that life does not work that way. 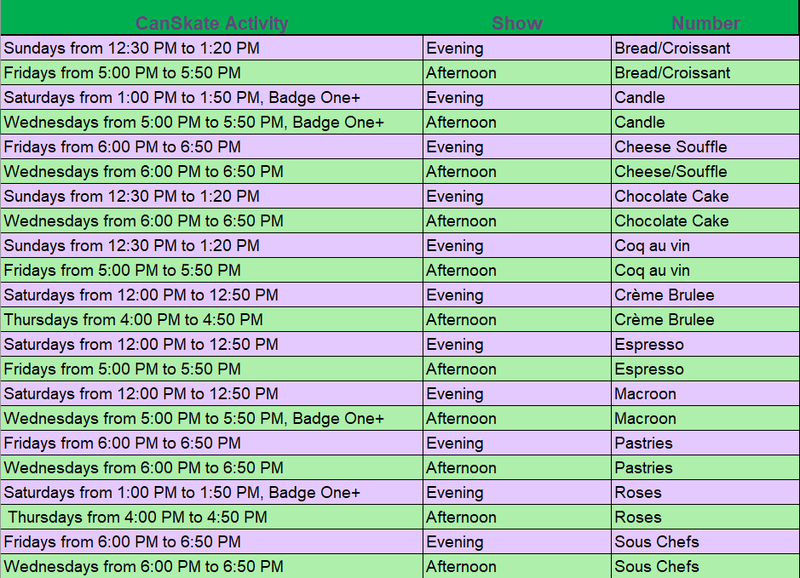 If you are unable to attend all the practices and are unsure of the steps perhaps you could reach out to a friend in the same number for some help. Rehearsals for CanSkaters will start on the week of February 20th. Click here for Canskate-numbers and click here to view the Grouped Canskaters for each number. 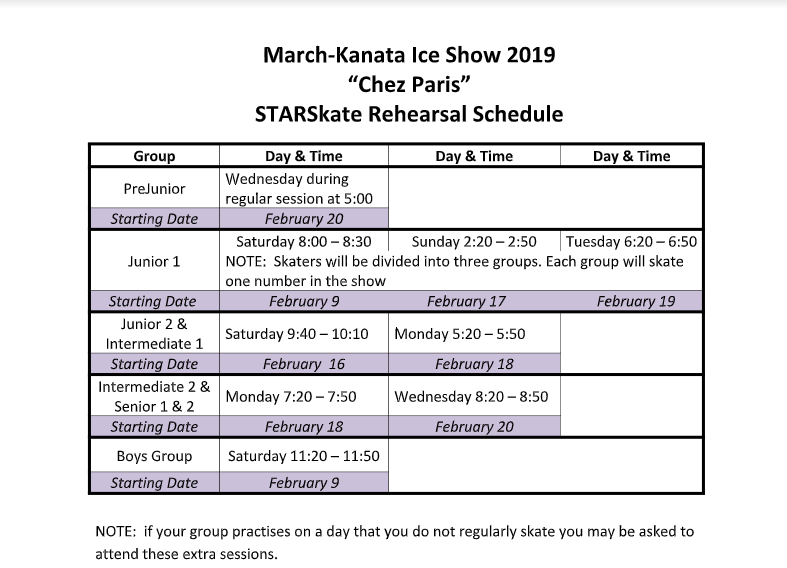 Rehearsals for Starskaters will start on February 9th click here for Pre-Juniors and STARSkate rehearsal schedule and click here for STARSkate Ice Show Practice Sessions. March Kanata Skating Club proudly presents its bi-annual ice-show. Skaters from all our various programs starting at CanSkate right up to our StarSkate and Adult skaters will be performing various numbers for their friends and families. Tickets are available closer to the event and are open to the general public and can be purchased online (a link will be available on our website soon). Ice Show practices will begin in the next few days! And will, for the most part, all be during the skaters' usual sessions. Dress rehearsal will be held on Friday, March 30th. The show will be held at the KRC Arena, off Legion Road – Saturday, March 30th at 1:00 p.m. and at 6:00 p.m. CanSkaters will be assigned to one half of the show. But will need to be at the dress rehearsal on Friday. Yes! All skaters from CanSkate stages 1-6 (includes pre-juniors and adults), through StarSkate, are invited to participate. In fact, our youngest CanSkaters are often the most popular part of the show. CanSkaters MUST be registered in the winter session in order to participate in Ice Show. There will be assistants on the ice with them and they will be ready to take part in the show. Each skater will be assigned to a specific group, according to skill level. During rehearsal time, our coaches will choreograph a number to fit the accompanying music, and it will be performed by the group during the Ice Show performance. Skaters are grouped according to skill level and age, and our coaches design each show number to showcase the appropriate skating level, so everyone can participate and enjoy! Each number is approximately 3 minutes. All skaters will participate in one number. As per Skate Canada rules, skaters up to Stage 6 must wear helmets. There is no need to register for the ice show, but we ask you please to notify your coach if your skater cannot make it to the ice show.